In this report we wind down the category analysis with Relief Pitching. Our group took a similar approach to the one used on Starting Pitching and subjectively broke all pitchers with relief innings into 4 groups based on the 5 factors of pitching. For starters with relief appearances and split grade starters we assigned a reasonable amount of potential innings. Our ranking is then based on the chart we created. We opted against creating an index as not every team has the same number of innings available. This worked for SP’s because each team would have exactly 90 starts. Total innings was also a final factor for ranking for several teams which had either way above or below the average number of innings. 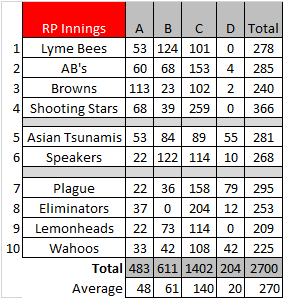 1) Lyme Bees: earned the top spot with a solid 53 “A” innings and 177 A & B rated innings, which was the highest in those groups of any team. 2) AB’s: close behind the Bees but coming in 2nd with only 128 A&B innings. 3) Browns: definitely one of the best bullpens with the most “A” graded innings of 113. The only reason they are 3 instead of 1 is a lack of innings with only 240 overall. This represents 30 innings below average and not enough for our league unless a team had a strong A+ graded rotation. 6) Speakers: 144 A&B innings made for a strong bullpen. The Speakers in hindsight were one cheater reliever from having possibly the best bullpen. 7) The Plague: Fell to this group with only 58 A&B innings. 8) Eliminators: Only 37 A&B innings drove this rating. 9) Lemonheads : A strong 95 A&B innings but not nearly enough innings with only 209. A strong rotation may mitigate this some, but we have to wonder what could have been for this team’s bullpen and even overall ranking if they hadn’t used so many roster spots on unusable players. 10) Wahoos: A respectable 75 A&B innings but again put in this group due to not having enough innings. 225 is not enough even in a 90-day season unless you have an A+ rotation. Never fear though as RP trades can be the great equalizer. We have to assume that this is the planned strategy for the teams short on innings if they remain in the pennant race. In the next edition we close out the journal with Part 10: The Final Rankings!